Bill Linley has finished his third book, "Trackside in the Maritimes 1967-1993" through Morning Sun Books. This book covers railway operations in the three Canadian Maritime provinces (New Brunswick, Nova Scotia and Prince Edward Island). Disclaimer: I consider Bill to be a good friend. The book starts with a couple of pages introducing Bill and his history with railfanning, then follows up with a two-page map of the Maritimes showing the rail lines (and ferry routes) in the period covered by the book. This is followed by a very brief history of railways in the Maritimes and a list of CP and CN's rosters in the book's time period. 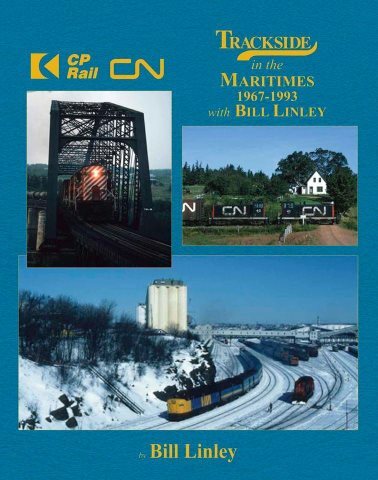 The remainder of the book presents each of CN's and CP's subdivision in the Maritimes, with full colour photos, generous amounts of text describing each photo, and side illustrations such as timetables and operating manuals. There are also sections for short lines / tourist railways such as Devco, Consolidated Bathurst and the Salem and Hillsborough Railroad. The majority of the 235 or so photos were new to me, despite my occasional reviews of Bill's slide collection when I was visiting him in Halifax. Bill has a vast collection of images that he has taken over the decades, so he had a lot to choose from. I'm sure it was difficult to narrow the images down. My particular favourites were the entire PEI section - which felt very much like a volume 2 of Allan Graham's A Photo History of the Prince Edward Island Railway , if Allan wrote one - as well as a photo of DAR through Windsor and the RSC-24s on the Middleton subdivision. I have no hesitation in recommending this book to anyone who is interested in Maritime railroading, or Canadian railroading for that matter. You can buy this book directly from Bill (bill.linley@gmail.com) or via Morning Sun's web site. Thanks for the book review Steve. And as a result, I ordered a copy for myself from Bill. Perhaps you could add more book reviews on your blog as an on going regular basis. You seem to know where to look and find these gems. Hi Glen, I'm glad you ordered a copy. I'd love to do more reviews. I tagged a bunch of my book reviews but I haven't done many recently. I should do more!